How can a material be intelligent? By being made up of particle-sized machines. 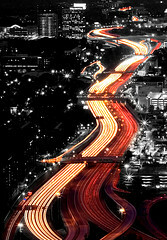 At Carnegie Mellon, with support from Intel, the project is called Claytronics. The idea is simple: make basic computers housed in tiny spheres that can connect to each other and rearrange themselves. Wach particle, called a Claytronics atom or Catom, is less than a millimeter in diameter. With billions you could make almost any object you wanted. The concept sounds like a macroscopic version of nanotechnological utility fog. 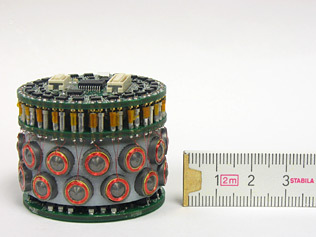 The image is of the most up to date Catom, which is still in the centimetre size range. Right now, computers are not fungible. With programmable matter, they would be. That same cubic meter of a billion catoms is essentially a network of a billion computers. That’s a lot of computational power – more than enough to organize it into different shapes. And if the computer was separated into sections, the overall computing power would still be the same. By making “tech” modular in this way the notion of discrete machines for different tasks goes away – you have a generic, all-purpose substance that you can lump together (like clay) to make the things you want. 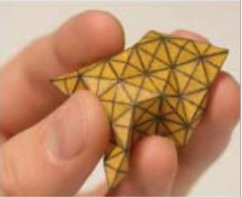 One team from Harvard is working on a kind of “generalized Rubik’s Cube” that can fold into all kinds of shapes. Another is trying to order large strands of synthetic DNA to bind together in a “molecular Velcro.” An MIT group is building “’self-folding origami’ machines that use specialized sheets of material with built-in actuators and data. These machines use cutting-edge mathematical theorems to fold themselves into virtually any three-dimensional object. Very powerful and potentially gamechanging. Presumably if and when these become available to the general public they will have various restrictions built into them that will promptly be overcome and hacked origami-tools will become the ultimate criminal penknife. On a more cheerful not this have wonderful applications in art and performance. Dozens, hundreds and even thousands of these Smart Dew sensors – each equipped with a controller and RF transmitter/receiver – can also be wirelessly networked to detect the difference between man, animal, car and truck.